Oak Leaf Design Bird Feeder. 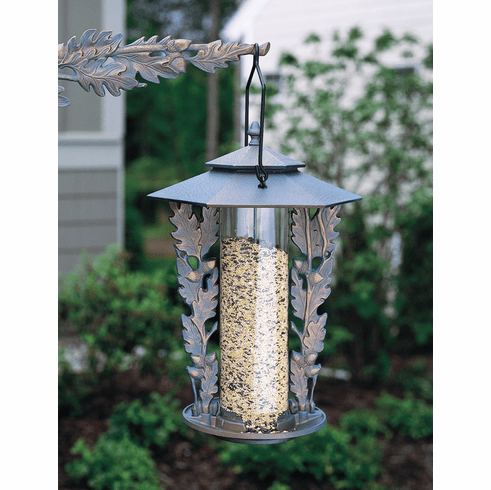 The Silhouette series of bird feeders not only have a beautiful nature design but, they have a very large seed capacity with easy fill access at the top (see inset). The tube is made of durable plastic but, the metal is rust-free aluminum that is built to last. It comes in a choice of three different colors. Each Silhouette Feeder measures 19" Tall (from the point of the top to the perch base) and is 12" wide. They also come with an easy hang handle at the top.